A pregnant woman lost her baby after authorities said the woman was shot in the stomach by another woman with whom she had been arguing on Facebook, the Daily Mail reports. The shooting occurred in Jacksonville, Fla., Wednesday after the expectant mother, identified as 23-year-old Markeisha Brooks, went over to 35-year-old Virginia Wyche's house to confront her about a dispute that had begun on Facebook the night before, ActionNewsJax reports. "They were arguing out front, something about Facebook," a neighbor, Christopher Cash, told a local station, the Daily Mail reports. "I walked out and just heard a pop." Brooks survived the shooting, but her unborn baby—six months along—did not. Wyche was taken into custody and charged attempted murder. She was being held on a $1 million bond. Investigators were trying to determine whether Wyche may have fired a weapon out of self-defense, ActionNewsJax reports. "Somebody had to provoke my child to anger to do what she done. I don't know if she was trying to defend herself, or [if they were] trying to jump on my child, I can't say," Wyche’s mother, Lillian Jordan told News 4 Jax. 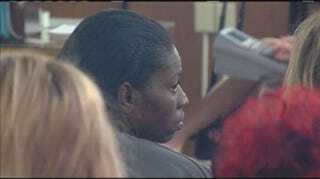 During a court appearance, Wyche said that Brooks had slapped her, prompting the shooting, according to ActionNewsJax.